Gold Medal's Compound-S is intended to be added to a batch of kettle corn when you're using everyday granulated sugar instead of a specialized kettle corn mix like Pappy's Kettle Corn Mix. Compound-S will help provide an even glaze, keep popped kernels separate, and keep your kettle cleaner by reducing the buildup of carbonized sugar. When you're using a specially formulated kettle corn sugar mix, this product is typically not necessary. However, if you're using a large drum cooker, it may be beneficial to add a small amount to each batch of kettle corn to help prevent the sugar from carbonizing on the side of the drum, keeping your equipment clean and your product tasting fresh. 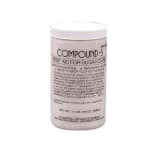 Pro Strength Compound S, (12) 24 oz. 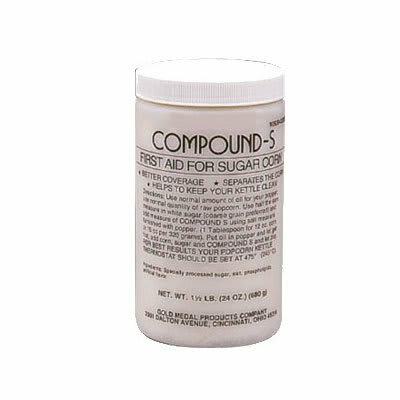 jars per case, compound "S" is a popular counter to use when you are putting plain sugar into your popcorn kettle during the popping process. Compound "S" actually helps keep the kettle cleaner. The improved, Pro Strength Compound "S" is more concentrated and further reduces the carbon build up when you pop with sugar. Directions: Put oil in popper add corn, sugar and compound S and let pop. For best results set your popcorn kettle thermostat at 475°.